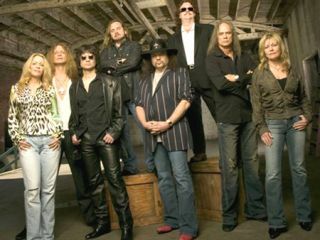 Everybody's favourite long-haired rockers Lynyrd Skynyrd have announced they'll be hitting the studio this autumn, and plan to release new material in early 2009. Skynyrd have spent the last year working with ex-Marilyn Manson/ Rob Zombie guitarist John 5 and, although the details are patchy, we can expect a 'darker' sound as a result. Former Blackfoot frontman and current Lynyrd Skynyrd guitarist Rickey Medlocke witnessed the collaboration: "We've been doing quite a bit of writing with John 5. 'Everybody thought, my god, you are going to write with this guy? How is that ever going to work?' But this guy came in and is really multitalented in all genres", Medlocke told Billboard.com. "I was surprised that this guy could sit down and play Glen Campbell and Roy Clark better than they do, and it blew my mind. And then he loves southern rock, the blues and country. It really blew us away". Two new tracks have apparently got the band buzzing: "the dark, anthemic Floyd" and "the uptempo "Bang, Bang". Whatever the songwriting results, let's hope Kid Rock doesn't get his hands on the mixing desk.